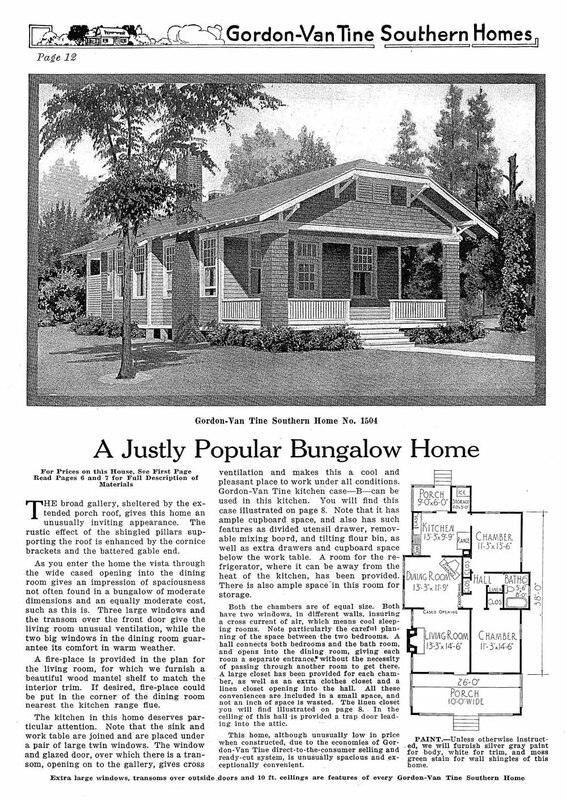 A couple of weeks ago, the post “Brick Bungalows and Plan Books” showed how house builders, using plan books and newspaper advertisements, sold the Craftsman style and more generally the bungalow’s “modern” open plan to middle-class buyers. 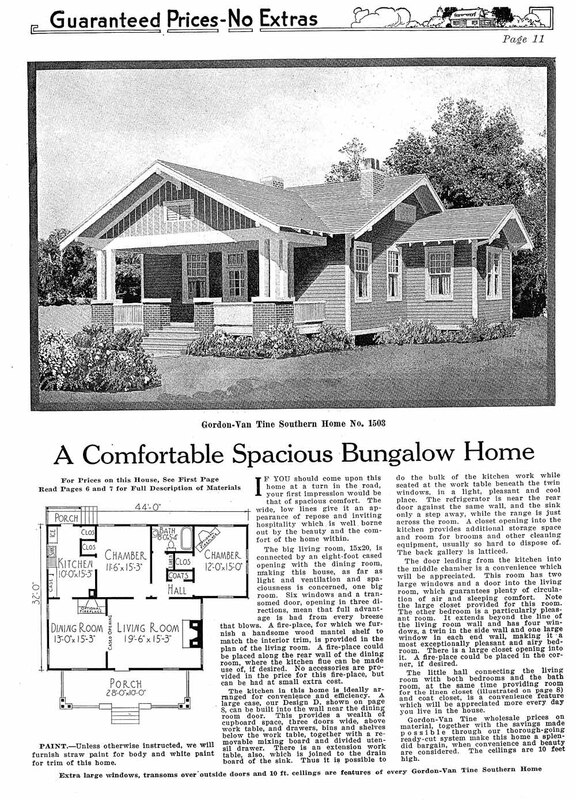 Today and next week we’ll look at a different kind of outfit that also sold bungalows to the middle class, but on a much larger scale and using an industrial model to factory-produce pre-cut house kits. 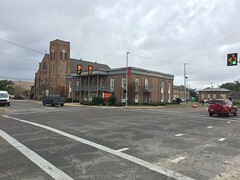 The Gordon-Van Tine Company was based in Davenport, Iowa, but had a large sawmill and factory in Hattiesburg. From looking at the 1925 Sanborn map, I know that the factory was located in the long block between W. Pine and Finlo Drive, and checking that area on Google maps, it appears that it was completely redeveloped somewhere in the 1950s or so. These homes are not northern plans, nor are they make-shift attempts to doctor northern homes up to “make them do.” They are real homes for the south, planned from the ground up for this book, and supervised by architects who have lived all their lives in southern states. 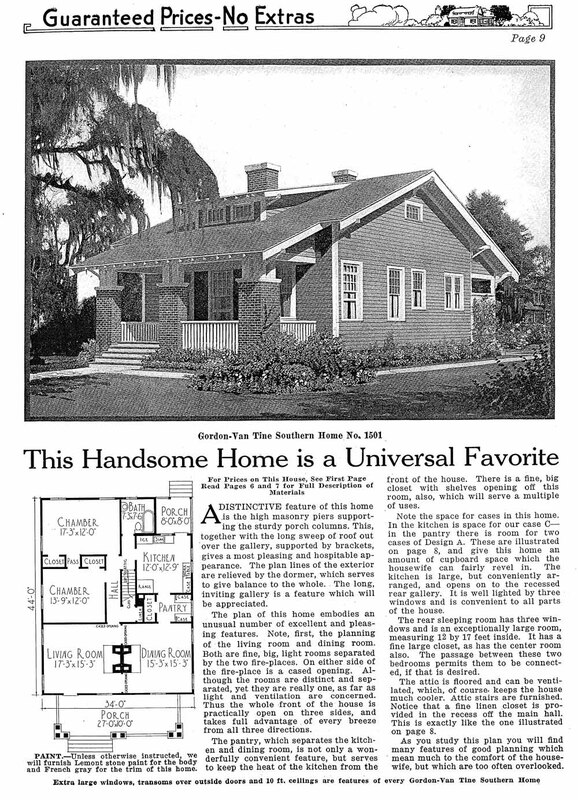 Features of these homes which will interest you are: Ten-foot ceilings throughout; seven foot doors, with transoms above, providing excellent circulation of air; large windows, carefully placed to insure best of light and ventilation; large rooms, carefully arranged for convenience, ease of communication and thorough ventilation; latticed rear galleries; construction provides for either lath and plaster or ship lap for inside walls, drop siding used for outside walls; fire-places provided in the important rooms, and optional fire-places for the other rooms, where wanted; doors and windows of finest material, will not warp, check, or rot, and will always hang true and not bind; built-in features in every home, such as kitchen cases, linen cases, dining nooks, etc., these features, combined with excellent quality of material throughout, careful planning to gain the desired effects at a minimum cost, and ready-cutting at our factory of all framing material, make these homes thoroughly well fitted for the south. 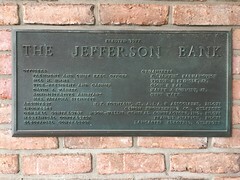 To emphasize the imprint of Southern expertise, they even included a letter from architect Francis J. MacDonnell of New Orleans. Architects and builders may also find interesting this little detail showing how the kits fit together. 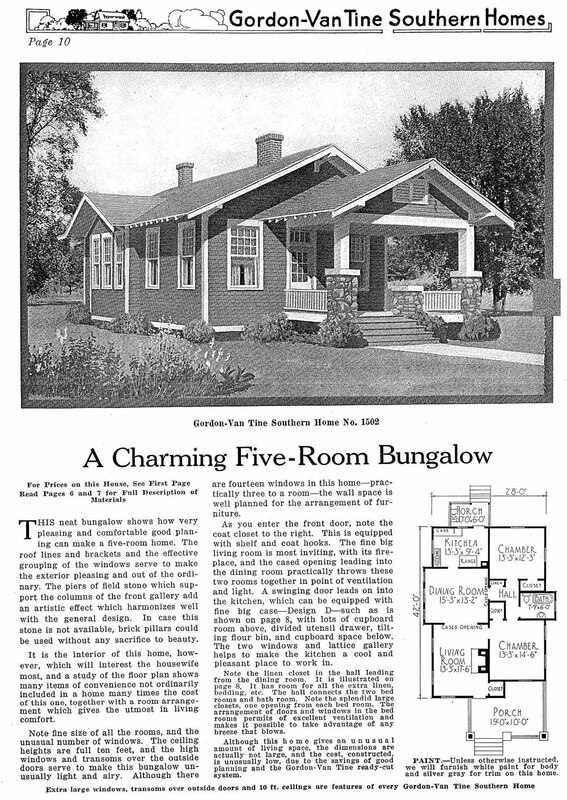 Almost all of the houses offered in “Southern Homes” are Craftsman bungalows. There are also some tenant houses in the back that I’ll show in another post, but these are the first set of plans in the catalog. I’ll bet if we all start comparing these to Craftsman houses in our communities, especially in the Hattiesburg area and along the Gulf Coast, we’ll start to find some matches. 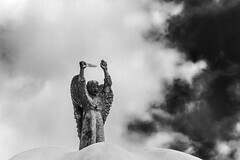 See more Gordon Van-Tine . . . I suspect that river towns(cheap transportation) like Davenport Iowa along the Mississippi would reveal a predominance of the pre-cut Bungalow homes. And for the same reasons, homes in towns located near the Mobile & Ohio RR. Unbeknown to me at the time, my first French word was port cochere. 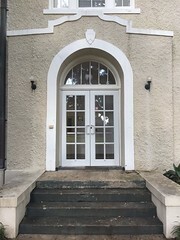 The home that my grandparents built on their farm– what is now Highland Park Cemetery– had a port cochere where the porch would normally be. The description for the interior of the Bungalow fits perfectly. 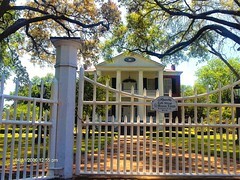 I won’t go into why my grandfather wanted only a short distance from the car to the front steps of the porch. It is very Interesting that in the pre-WWII era, many homes were kit-made, but I do not know why that fell out of favor. Other than mobile homes, why are most new homes today made from scratch materials cut or trimmed in place? Depending on the skill of the workers, there is a lot of wasted timber, measurements are imprecise, and often they need to make shims or adjustments to fit windows and doors. It just looks like a wasteful process. 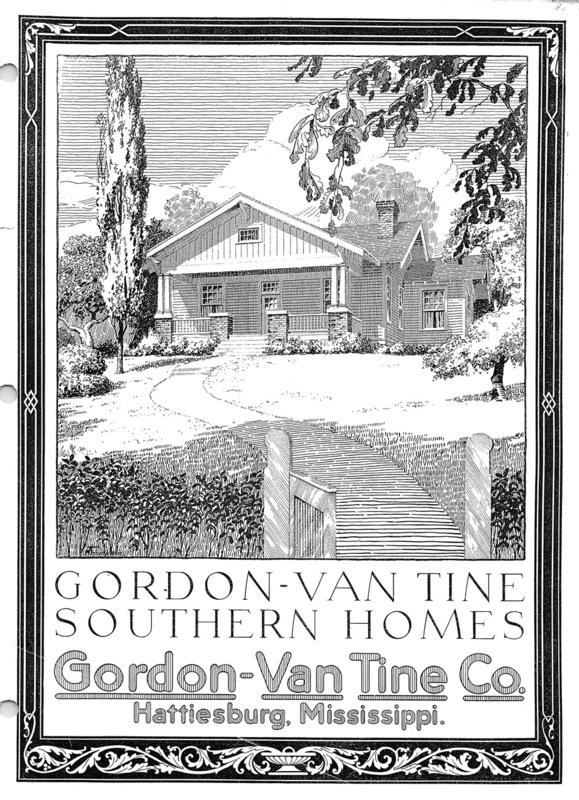 McComb has a lot of Craftsman-style homes that I would be willing to bet are Gordon Van-Tine homes or were based on them. Our home, when we lived there was actually a Sears home that my late father-in-law remembered being brought in on a truck to be constructed. Love your research and seeing parts of my precious home state that I don’t get home to often enough! Great post! I have to wonder how accurate they really were and how easy the assembly really was. I’m anxious to see if some existing examples surface here! Thank you for the kind references to my Gordon Van-Tine website. I visited Hattiesburg many years ago and visited both the old GVT and Aladdin Homes factory locations. 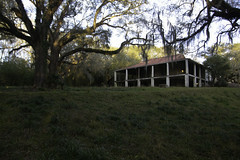 I also photographed several GVT model homes. The GVT Southern Homes catalos is one of the few catalogs I don’t have as it is very rare. https://polldaddy.com/js/rating/rating.jsThe police officers that were killed were chasing the robbers from a car lot on Main street. The crook stopped in front of the 4th street grocery store. He had his girlfriend with him and when he shot the officers she jumped in the driver’s seat and ran leaving the murderer on foot. They were not in the grocery store. I never claimed that the Fourth Street Grocery was “robbed.” I did assume there had been an attempted “burglary” in progress, since it was night time. I did not recall that there was a “stickup” at the main street car lot that night.